Warsaw, Poland - A team of prosecutors will investigate suspected irregularities in the restoration of Warsaw property seized by the communists to private owners, a spokesman for the national prosecutor’s office said Thursday. Cases have been revealed in which persons seeking restitution concealed the deaths of owners they claimed to represent, or in which lawyers or businessmen paid glaringly low amounts of money to buy restitution rights from rightful owners. Poland is the only nation in central and eastern Europe without proper legislation that would regulate the return of seized real estate. Individual claims are reviewed by courts and their restitution orders are executed by city hall officials. Restitution became possible in 1990, after communist rule ended. Irregularities in the restitution process have been public knowledge for years, but they are now at the heart of political struggle for control of Warsaw which is run by the Civic Platform party, in opposition to the national government of the conservative Law and Justice party. Since 1990, most Warsaw mayors have been linked to parties that gave rise to the Civic Platform, except between 2002 and 2005 when Law and Justice ran the city and also made some restitution decisions. Legislation that will address some of the issues will take effect Sept. 17. Mayor Hanna Gronkiewicz-Waltz, in office since 2006, has pushed for the legislation in reaction to reports of problems. 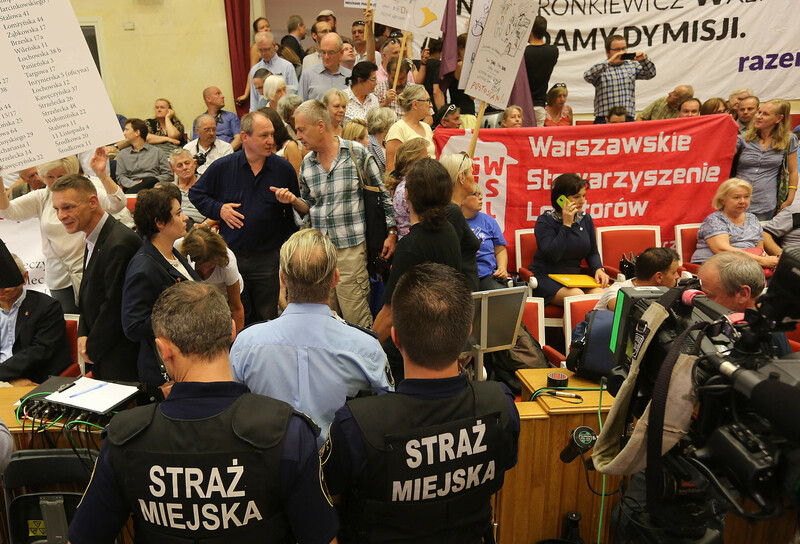 On Thursday, Gronkiewicz-Waltz addressed an extraordinary session of the city council, shown live on TVN24, that she had convened in reaction to calls for her resignation. The hall was filled with dozens of Warsaw residents and representatives of left-wing groups who whistled and chanted to blame her as she spoke. The mayor said all political forces that have ruled Warsaw were guilty of failing to properly regulate the return of property and stressed she was the only one to successfully push through legislation. She said she would not resign. Communist authorities imposed on Poland as a result of World War II seized real estate in Warsaw from its pre-war owners, including Jews, under a 1945 decree. They argued it was necessary to help them reconstruct Poland’s capital that was devastated in World War II. Spokesman for the national prosecutor’s office, Maciej Kujawski, said that special prosecutors will investigate alleged irregularities.